I’m headed out to a Thankgiving party tonight and was put on stuffing duty. I love making bread stuffing. I even ate some of the uncooked portions as I was making it. However, I wanted to bring something else too, use a little bit of creativity without making a dessert (since that’s what everyone offered to bring). I then found a recipe for Maple- Roasted Brussels Sprouts with Bacon + Toasted Hazelnuts from Ambitious Kitchen. I wanted to make them so badly, but did not want to be that person who brings something unassuming that secretly contains nuts. So I omitted the hazelnuts, added extra maple syrup, and tried to not eat them all the second they came out of the oven. I also doubled the original recipe so it would feed more party goers. It was so easy to make these and the maple syrup really amps up the smell and taste of the dish. 2. Cut Brussels sprouts in half and toss with olive oil, salt and pepper. Set aside. 3. Cook bacon in skillet over heat until they start to crisp. Cut into pieces and set aside. Do not turn off skillet. 4. Cook brussel sprouts in the leftover bacon grease. While cooking, coat sprouts with maple syrup. Continue to cook until the sprouts begin to brown. Turn off heat. 5. Pour maple-covered sprouts into baking dish and bake for 30 minutes. 6. Add bacon to the sprouts and bake an additional 10 minutes. 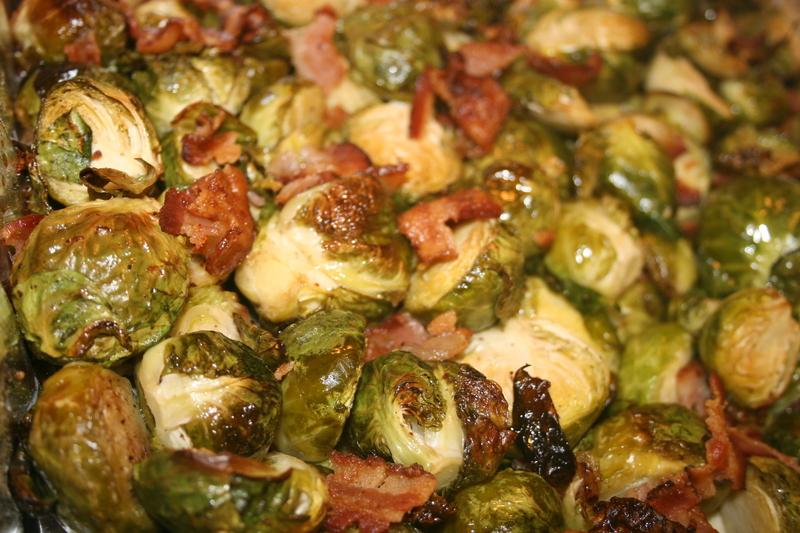 Your article Maple-Bacon Brussels Sprouts | Dining With Dani write very well, thank you share!